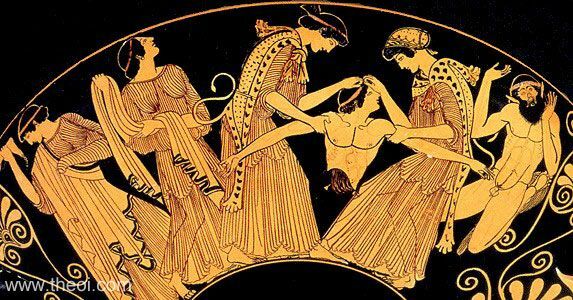 King Pentheus of Thebes is torn limb from limb by the crazed Maenads of the god Dionysus. The two central figures, draped in panther skins and holding the king's body, are the sisters Agave (mother of Pentheus) and Autonoe. A third Maenad holds the king's severed foot. One of Dionysus' Satyrs oversees the sparagmos (ritual dismemberment).